Full-Day Training - Sunday, March 11, 2018, 8:00 a.m. - 4:30 p.m.
Awaiting CEU approval. Sign up for a certificate at registration. This workshop will expand the participant’s knowledge of advanced topics in the area of National Environmental Policy Act (NEPA) practice. This eight-hour intensive workshop will focus on training environmental professionals to more efficiently complete NEPA environmental reviews and improve the interagency coordination process, while sharpening advanced impact analysis skills. Topics covered will include NEPA project management, strategies for improving agency NEPA practice performance and accelerating NEPA reviews, purpose and need statement and alternatives formulation, developing a proper scope of agency actions, developing effective cumulative impact analyses, and an overview of techniques for developing clearer writing for NEPA documents. The target audience for this workshop would include experienced NEPA planners, managers, decision-makers, environmental engineers/scientists/ specialists, consultants, regulators, applicants and attorneys who require an in-depth understanding of NEPA law, policy, and project management within their area of environmental expertise, especially those who serve on NEPA interdisciplinary teams, work with NEPA planners, or those who review/edit NEPA documents. This workshop will also benefit those professionals who work in related natural resource disciplines who work with federal land management or real estate transactions, federal agency projects or permitting, and transportation or other infrastructure projects with a NEPA review component. Instructors for the workshop will include the nation’s leading NEPA experts from the White House Council on Environmental Quality (CEQ), federal agencies, attorneys, and consulting firms. Sunday, March 11, 2018, 12:30 – 4:30 p.m.
Attendees: Please be prepared for rain and wind and a 1 to 2-mile walk. Mark Mazzola is the Environmental Manager for the Seattle Department of Transportation. Mark serves as the environmental lead for the City’s Elliott Bay Seawall and Waterfront Seattle projects, which together represent over $1 billion worth of investment in Seattle’s central waterfront. He has a B.S. in Biology from the University of Notre Dame and an M.S. in Community and Regional Planning from the University of Texas. Merri Martz is a senior managing scientist at Anchor QEA, LLC. She was the environmental and habitat lead for the consultant team supporting the Seattle Department of Transportation for the feasibility and design phases of the Elliott Bay Seawall Project. She has a B.S. in Chemistry and Biology from Pacific Union College, a M.S. in Chemistry from U.C. Santa Cruz, and a M.M.A. in Wetland Ecology from the University of Washington. She has been managing and designing habitat restoration and enhancement projects throughout the U.S. since 1994. Stuart Munsch is a fishery biologist with the National Marine Fisheries Service that recently earned his Ph.D. from the University of Washington. His graduate research examined fish ecology along modified shorelines, which informed the construction of Seattle's fish-friendly urban waterfront. Ms. Page is a principal environmental planner with Anchor QEA managing environmental processes on a variety of complex projects with a focus on infrastructure within or adjacent to aquatic systems. She manages and prepares National and State Environmental Policy Act environmental documentation, ranging from exemptions/exclusions to Environmental Impact Statements. Ms. Page also leads the permitting process from design through construction for design-bid-build and design-build projects, including providing environmental compliance support during construction. As part of the Elliott Bay Seawall Project, she managed environmental studies conducted by Anchor QEA and was responsible for preparing and implementing a permitting approach. Ms. Horwitz is a managing environmental planner with Anchor QEA with a focus on public infrastructure projects. She has over 20 years of experience in community and environmental planning, primarily in the Pacific Northwest. She has been the lead planner on numerous National Environmental Policy Act (NEPA) documents, as well as consultation under the Endangered Species Act and Section 106 of the National Historic Preservation Act. Ms. Horwitz has extensive experience in tribal consultation, with attention to natural resources, cultural resources and treaty fishing. Ms. Horwitz served in the role of environmental compliance manager over the four-year construction period of the Elliott Bay Seawall Project. Half-Day Afternoon Training - Sunday, March 11, 2018, 3:00 - 4:30 p.m. Learn what it takes to land an environmental job that is a good fit for you both from a skill set perspective and from the hiring perspective. This workshop is for anyone seeking an environmental career or who are already working and wants to make a switch. We will also cover the benefits of being a NAEP member throughout your environmental career. As a bonus, stay after the training to get a smooth introduction to networking as we accompany you to the networking reception. Leslie Tice is a career-long NAEP member currently serving as an elected board member and the Membership Chair. She is a Certified Environmental Professional and has about 20 years of experience leading NEPA, CEQA, and other state environmental impact analyses, regulatory processes, and other environmental programs across numerous sectors of our industry. Leslie leads HDR’s cross-sector environmental program in Northern California managing a team of about 60 planners, scientists, biologists, cultural practitioners, and managers. This includes technical leadership, staff development, recruiting and team growth, and business development. As such, Leslie plays a daily game of team development and relies heavily on her NAEP and state AEP networks and tools to fulfill her professional objectives. She believes that this method of constant learning and collaboration is what makes us better at what we do, creates opportunities we wouldn’t have had otherwise, and it also makes the challenges more fun to figure out. John is the Director of the Environmental Career Center and Partners Achieving Sustainability Excellence Corps (PASEcorps.org). He also served as president of the ECW Environmental Group. John is an environmental careers leader having established the 14 Environmental Career Center (ECC) in 1980. ECC operates EnvironmentalCareer.com, conducts environmental careers research, provides environmental careers coaching, operates environmental intern programs for employers, published the Green Careers Journal, and conducts environmental career seminars including many sessions at National Association of Environmental Professionals (NAEP) annual conferences since 1995. John has 30 years of sustainability, ecological and the National Environmental Policy Act (NEPA) experience with federal, state, and local agencies and consulting companies. He has a bachelor’s degree in wildlife ecology from the University of Minnesota and graduate studies in wildlife biology at the University of Wisconsin – Stevens Point. He led the NAEP Career Development Committee and Subcommittee for seven years. Laura Thorne, BS, PMP, LSSGB, GEN-X, RVr, has over 25 years of experience working in management and consulting roles in various industries. She started her own management consulting business after working 10 years with a local environmental government agency and full-time RV’ing for 3 years. As a minimalist and a realist, she has been praised for her ability to break complex issues into manageable bites. She specializes in guiding organizations through a 3-Step Integrated Strategy to Solutions System to re-align their operations and propel them forward! While serving in roles, such as the President of the Tampa Bay Association of Environmental Professionals, Vice President of Hillsborough County Toastmasters, and advisor on the Hillsborough Education Foundation Scholarship Committee, Laura utilizes her Quality Award-winning performance excellence skill set to help others work more effectively to improve results. In 2016, she spearheaded an annual Women in STEM Workshop and group specifically focused on women in environmental careers and has started coaching environmental students on their transition from academia to workforce. Brock is currently an Associate Vice President and serves as the Southeast Environmental Planning Practice Leader and Operations Manager for the HNTB Atlanta Office. Brock has 19 years of experience in the consulting industry managing delivery of NEPA documents for a wide variety of federal infrastructure expansion projects across the country including highway, rail, bridge, pedestrian trails and transit projects. Brock leads the efforts of professional NEPA staff including ecologists, historians, archaeologists and planners. Brock has been committed to the environmental profession by becoming part of the National and local scene of the profession since 2004. Brock led the initiation of the Indiana Association of Environmental Professionals (INAEP) Chapter in 2005 and was President and NAEP Chapter Representative for INAEP from 2006-2010 and moved to Georgia in November 2011. For NAEP, he is currently serving his second term as Immediate Past President. As a NAEP board member, Brock has worked to support NAEP current initiatives as well as work on new initiatives to grow NAEP as an organization in membership, increase the associations image within the industry, and develop forums for continued interaction and education between members and the industry. The Elwha River on the Olympic Peninsula once produced large runs of huge salmon that supported generations of indigenous peoples and then provided a bounty for settlers. Two dams built nearly a century ago cut off all but five miles of river from the salmon and cause precipitous declines in their runs and changes throughout the watershed extending deep into the Olympic Mountains. 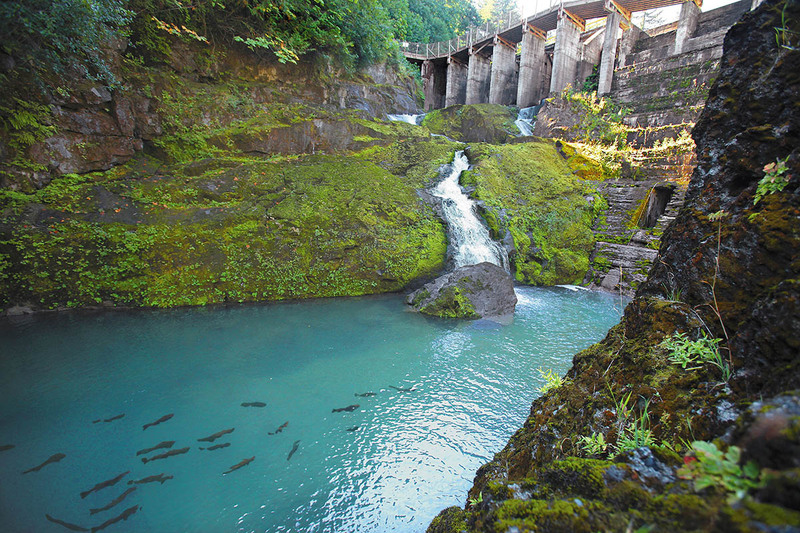 Now the dams have been removed, the largest project of this type in the world, and the salmon are returning. For the 2018 annual conference NAEP will be providing information packets on the Elwha dam removal and nearby areas for self-guided tours. Information will include directions to sights on the Elwha, suggestions for where to stay and visit in the area, and sources of background information. The Elwha area is about a three hour drive from Tacoma, WA and easily reached before or after the conference. Please visit Wikipedia or the National Park Service to learn more! In addition to featuring several local eateries as part of the Dine-Around Tacoma event, one of the dinners will be held at the Forum, an historic building within several blocks of Hotel Murano. This dining venue will be part of the Historic Brewery Tour, hosted by the Historical Resource Associates (HRA). Following the dinner at the Forum, the tour will cover other historic breweries in close vicinity such as the Odd Otter and Pacific Brewing. The other dining venues for Dine-Around Tacoma will be announced as they are confirmed. Dinners for Dine-Around Tacoma are scheduled from 6:00 PM – 8:00 PM. The Historic Brewery Tour will continue after the dinners, and participants from other event locations would be allowed to participate. This tour will feature a waterside tour of the 2,700-acre Port of Tacoma and the Northwest Seaport Alliance’s south harbor, the third-largest container gateway in North America. The Port of Tacoma's real estate and marine cargo operations generate more than 29,000 jobs and nearly $3 billion in economic activity. Combined, marine cargo operations at the ports of Seattle and Tacoma support 48,000 jobs and generate nearly $4.3 billion in economic activity. Port staff and consultants will discuss port history, operations, environmental legacy/remediation, stormwater, and environmental review and permitting for port development and re-development projects. Commencement Bay is part of Puget Sound, a large waterway carved out by glaciers over several Ice Ages and connected to the Pacific Ocean. The Puyallup River, which begins at Mount Rainier, flows into Commencement Bay, creating a large delta area, or tideflats. Over the past 150 years, mainly before environmental laws were created, the tideflats were filled to create industrial land to support the industrial revolution and war-time industries which contributed to pollution issues. In 1981, the Environmental Protection Agency listed Commencement Bay and the industrial nearshore/tideflats as one of 115 top-priority hazardous waste sites targeted for action under the initial national priority list of Superfund/Comprehensive Environmental Response, Compensation, and Liability Act (CERCLA). Since then, extensive remediation and restoration projects have been implemented to restore Commencement Bay. On-going source control and stormwater laws have been implemented to prevent recontamination. Environmental review and permitting addresses nine Endangered Species Act-listed species and associated critical habitat, state fish and wildlife resources, cultural resources, shoreline and critical areas, fish and wetland mitigation, transportation, and other NEPA/SEPA topics. This tour will allow you to view much of this area and hear about on-going efforts to maintain a healthy working waterway. It will be both educational and fun.